I recently went to Laikipa North in Kenya and met with Naatum women’s group. The community lives on arid land that has serious land degradation issues due to climate change, on ranches owned by men in the community. Laws dictate that women cannot own land. In 2016, the Laikipia Permaculture Centre, in partnership with Permaculture Research Institute Kenya, engaged the community elders to allocate a few acres of land to 25 women who worked on restoring the land. They set up water harvesting structures and created resiliency. The group transformed a barren land and gave it life, making farming possible. These women are now generating income from growing aloe vera and keeping bees, and they can feed their families every day, instead of the previous 11 meals per month. The successful transformation of the land by women farmers is clear, and now the community is prepared to give them more land. Will the male owners claim their land back now that there’s progress? I don’t know. But for now, this is a great example of community-led grassroots solutions working to improve women’s rights and help the community, without necessarily creating animosity between men and women. It is important to support efforts like these that bring women farmers more rights and equality in their work. Women farmers are busy. They tend the land, milk the cows and take care of their families. Not only are women farmers constantly working to feed and care for their family, but they also feed a bigger family; the world’s growing population. If you had a fruit or vegetable today, there’s 43% chance it was produced by a female farmer. Studies show that women account for nearly half of the world’s smallholder farmers and produce 70% of Africa’s food. Yet, less than 20% of land in the world is owned by women and over 65% of land in Kenya is governed by customary laws that discriminate against women, limiting their land and property rights. This means that women farmers have to access land through either their husbands or sons. Sometimes these male family members move to the cities leaving women behind to tend the land – land they have no right to own, use as collateral or sell the output without consent from the men. 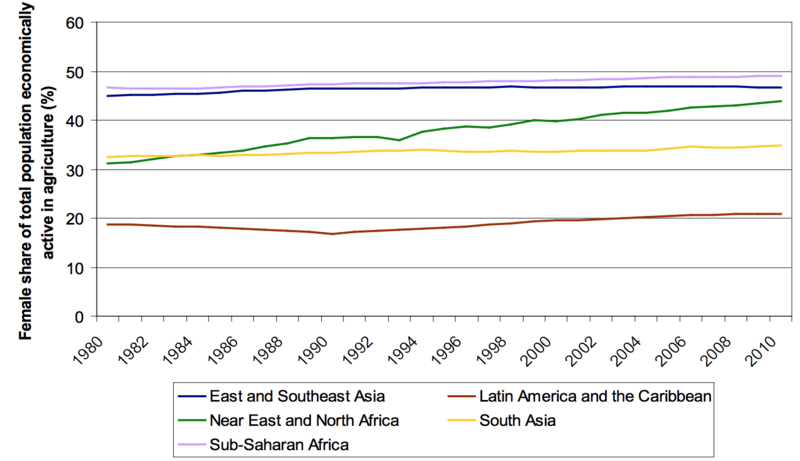 Female share of the agricultural labour force. Why should women own the land? Research shows that if women had the same access to productive resources as men, they would increase the yields of farms by 20%-30% and reduce hunger by up to 17%. In addition, women plough back profits to their households, therefore alleviating poverty from the bottom up. Given that they have vast indigenous knowledge of local plant species, this helps them provide a wide variety of nutritious food for their family, therefore curbing malnutrition at a household level. This means that by limiting women’s rights to land and other assets, we are denying ourselves the opportunity to increase food production, reduce hunger and limit malnutrition. Most societies remain predominantly patriarchal and women are consistently marginalised due to societal norms. To create change, we need bottom-up solutions that bring both women and men together to come up with solutions, like in the case of Naatum women’s group. Legislation alone is not enough to change society’s views on women’s property rights. The legal processes as they stand are expensive in terms of money and time and can sometimes be counter-effective to the desired outcome, as it might create hostility between the men and women in these societies. But in the long-run, such changes can improve a community. As former US President Barack Obama said: “Communities that give their daughters the same opportunities as their sons, are more peaceful, are more prosperous and develop faster.” This is as true in the agriculture sector, as it is for any industry. To be clear, I am not saying the responsibility of feeding the world’s growing population or taking care of the family rests solely on the female farmer, nor am I saying female farmers should only focus on food production and not take part in agricultural innovation and research. My point is, women are currently the workforce for food production, yet they have no access to the very basic tools required to produce food. Closing the gender gap in agriculture and supporting women in their quest to have land ownership rights and access to the right tools will see their efforts quadruple, and will help us achieve Sustainable Development Goals #2 and #5. It is 2018. We must march in support of the hands that feed us.